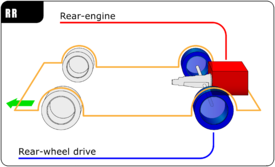 In automobile design, a rear-engine design layout places the engine at the rear of the vehicle. The center of gravity of the engine itself is behind the rear axle. This is not to be confused with the center of gravity of the whole vehicle, as an imbalance of such proportions would make it impossible to keep the front wheels on the ground. Packaging: since there is no need for a transmission tunnel, the floor can be flat. Rear traction: having the engine located over the driven wheels increases downward pressure, which is helpful for grip on loose surfaces, although can be prone to oversteer. Simplicity of manufacture: the engine is near the driven wheels, and the transmission can be merged with the differential to save space. This layout was once popular in small, inexpensive cars and light commercial vehicles. Today most car makers have abandoned the layout although it does continue in some expensive cars, like the Porsche 911. It is also used in some racing car applications, low-floor buses, and microcars such as the Smart Fortwo. Some electric cars feature both rear and front engines, to drive all four wheels. Smart Fortwo's three-cylinder engine officially sits behind the rear axle. ^ "1965 Chevrolet Corvair". Retrieved 16 March 2019. ^ "What Is Rear Engine Layout And Know How Is It Beneficial?". Retrieved 16 March 2019. ^ Threewitt, Cherise. "10 Affordable Rear Engine Cars". Retrieved 16 March 2019. ^ Wong, J. Y. (2008). Theory of Ground Vehicles. Hoboken NJ: Wiley. p. 560. ISBN 0-471-35461-9. ^ Adams, Eric. "The Secrets of Electric Cars and Their Motors: It's Not All About the Battery, Folks". Retrieved 16 March 2019. ^ Golseth, Andrew. "Why Is The Chevrolet Corvair Such An Overlooked Classic?". Retrieved 16 March 2019. This page was last edited on 16 March 2019, at 18:14 (UTC).